Posted on June 17, 2016 June 18, 2016 by RajalakshmiParamasivam. Click here to read Mahabaratham-16. In the last post we saw Lord Krishna rolling out the sari bale and saving Draupadi from malignment. After getting back the lost kingdom, Pandavas were ruling Indraprstha for sometime. But, will Shakuni and Duryodhana allow them to rule in peace? With Dirithiriashtran’s connivance, they sent again an invite for a game of Dice. As per the custom that prevailed then, a king should not reject an invite for a Dice game.So, Yudhishtran accepted the invite. And the Pandavas went to Hastinapuram to play this evil game. It is needless to mention here that again the Pandavas lost the game to the wicked Duryodhana. Now the rules of the game were different. As per the rules of the game , Pandavas (losers) should spend 12 years in exile and one year incognito. And if incognito , their idenntity was disclosed, they have to start all over again…that is another 12 years in exile and one year incognito. With this deal, Shakuni and Duryodhana, were very happy. Both of them thought that they could easily recognise the Pandavas incognito. So they can be made to go to forest for another 12 years and another year incognito.. They thought by this way, they can always keep the Pandavas away from the throne and make them devoid of their kingdom. After losing the game of Dice, Pandavas with Draupadi started their their forest life (vanavas). Time and again Draupadi and Bheema were trying to convince Yudhishtran to avenge Kauravas for their evil deeds.Yudhishtran always kept his cool and tried to pacify them. But Bheema , in full anger , pulled up his arms and showed his strength and readiness for a war with kauravas. These conversations now and then arose among them. In the meanwhile, they met the great sage Veda Vyasa. He advised them to get divine weapons from the Gods . And he also pointed out, that Arjuna was the right person to get that. Accordingly Arjuna, moved to a thick forest and started his penance for the divine weapons. As he was meditating, he was disturbed by the grunt of a wild boar. When he opened his eyes, he saw a wild boar running in front of him. He ran behind the boar. With his bow and arrow, he shot the animal. At the same time another arrow from some where came and shot the boar. Arjuna looked at the direction of the arrow, with anger well written on his face. Very soon, a tribal couple came there.The tribal calimed to have killed the boar with his arrow. His wife acknowledged it. But Arjuna claimed to have shot the boar to death. There started a verbal duel between both. Soon it turned into a combat. Both Arjuna and the tribal man had a fierce fight. Arjuna had not expected such a fierce attack from an ordinary tribal man. He realised that this tribal has an equal or even more strength than himself. At one point the tribal pushed Arjuna down and gave a hearty laugh. Arjuna,now realising the tribal man is not an ordinary person, begged the man to reveal his identity. There emerged Lord Shiva with His Consort and blessed Arjuna with Pasupathasthra, a divine weapon. Later we shall see that this Pasupathasthram will help Arjuna in the Kurukshetra war. A lot of incidents happened in the forset life of Pandavas. Though Iam not going to tell you each and everyone.,I shall try to highlight a few which are noteworthy. In the next post I shall come with another interesting one…. Posted on March 27, 2016 March 28, 2016 by RajalakshmiParamasivam. When Draupadi was summoned to the dice hall, she refused to go there . This enraged Duryodhanan .So he sent his beloved brother Duchasanan to fetch Draupdi to the dice hall. Duchasana entered the royal women chamber where Drauapadi was seated. As soon as he entered , he called Draupadi with great disrespect, to accompany him to the Dice Hall . Draupadi again refused to go with him. After a few minutes of argument between the two, Duchasanan tried to drag her forcibly. When she still resisted, he dragged Draupadi by her long hair.As she was dragged forcibly, she lost her balance and fell down . Her long hair went loose and she was dragged all the way to the Dice hall. The whole palace was dumbfounded to see a queen being dragged along the floor.She even suffered bruises on her body. She was dragged to the centre of the hall where her husbands were standing with heads bowed down. Not one of her husband came to her rescue. Angered and dejected by their behaviour, she sought the help of the elders seated there. Even the elders, for fear of earning enmity of Duryodhanan, were silent. But they knew that injustice was being done to Draupadi..
Karna gave a hearty laugh. The court had learned people like Bheeshmar, Dronachariar, Kripachariar. They were all dumbfounded by this order. Though they felt very sad about the happenings, they remained silent. One person who protested against the injustice to Draupadi was the one and only Vidhurar, Mahamanthri. But his protest fell into deaf ears and just vanished into a black hole . He was even insulted by Duryodhanan. As though waiting for this order, Duchasana took hold of Draupadi’s sari and started disrobing her. At first Draupadi pulled her sari tight to her chest, But very soon Draupadi lost control..
Lord Krishna on hearing His devotees prayer, rushed to rescue Draupadi. He did not come in person. But he saw to it that the length of the sari becme endless. He saved Draupadi from further dishonour. Duchasana was pulling the sari from Draupadi. And Draupadi with closed eyes and hands raised kept on saying,” Govinda save me.” Minutes rolled by. But the other end of Draupadi’s sari was not to be seen. Duchasana kept on pulling the sari. But to Duryodhana’s dismay and surprise , Draupadi was saved from further dishonour. Her husbands, and elders heaved a sigh of relief. Very soon Duchasana got tired. He saw that he had pulled down bales and bales of the sari . Only his hands got tired. But Draupadi was standing there in full dress. At one point the tired Duchasana , fainted by the side of the sari pile. On hearing this, Dirithirashtran was shocked. He understood what Draupadi meant.That worried him as he was very much aware of the strength and valour of Pandavas. Now Draupadi made use of the situation and saved her husbands. As a first boon, Draupadi asked the king to relieve her husbands from slavery and by the other she asked for their kingdom and wealth back which was lost in the Game of Dice. Dirithirashtran without any hesitation granted them. Shakuni and Duryodhanan, were angry at the happenings now going on. They clutched their teeth in anger. Till then,all there cunning plans were taking perfect shape. But Gandhari entered the hall and foiled all that. The ashamed Pandavas relieved of their slavery also vowed to take revenge for Draupadi’s insult. Especially Bheema’s thundering vow to kill Duryodhanan with his maze and Arjunan’s vow to kill Karna in the battle field sent shock waves amongst the Kauravas. The ashamed and angry Pandavas, with Draupadi and Mother Kunti , returned back to Indraprastham. But will Shakuni and Duryodhanan allow the Pandavas to rule in peace? They planned for another Game of Dice. But will the Pandavas accept to play the game? Let us wait and watch……. Posted on January 17, 2016 January 18, 2016 by RajalakshmiParamasivam. Duryodhanan, felt insulted by Draupadi, in Indraprastha . The flame of vengance was burning in his heart. Not only he wanted to insult Draupadi back, he was also jealous of the wealth and the beauty of Indraprastham. To fulfil his vengance , he sought the help of his maternal uncle, Shakuni. Shakuni was always ready with his cunning ideas to defame the pandavas. He came out with a master paln.. Duroyadhana was more than satisfied at what Shakuni told. Durodhanan accompanied by Shakuni went to meet the king Dirithirashtran. Durodhana told his father,” Father , Why not we call Yudhishtran for a game of Dice? ” ( It was the practice of kings to play this gambling game occasionally.) Dirithirashtran was not happy with this . He tried to convince Duryodhanan, to stay away from this act, by telling all the evils of the game of Dice. But Duryodhanan who had a vengence, never lent his ears to all this advice. After much arguements, finally Dirithirashtran’s love for his son won over. Yes. He asked Viduran, minister/younger brother, to carry the Dice invitation to Yudhishtran. And Viduran with great reluctance took the invitation to Indraprastha. The Pandavas, with Kunthi and Draupadi went to Hastinapuram. A hall was decorated to play the game of Dice. A beautiful play chart was placed In the centre of the hall and on both sides Pandavas and Kauravas were seated. Then the rules of the game were formulated.The elders , Bhishmar, Dronachariar, Kripachariar, Dirthirashtran, Vidhurar were left with no option but to witness the evil game.Karnan, Asvathaman also were present there. To add more ,to this evil act, Duryodhanan declared that his maternal uncle Shakuni would roll the dice on his behalf. It has to be mentioned here about Shakuni’s special power. He had the power to roll the dice in his favour. It must have been fate which was clouding Yudhishtran’s mind . And so he agreed for all that Duryodhanan and Shakuni said. 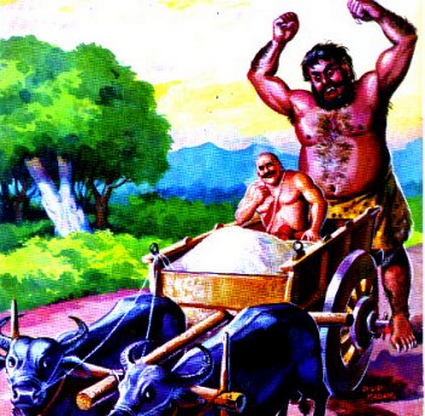 Yudhishtran first wagered his cows. The dice rolled to drive the cows to Kauvaravas side. Then Yudhishtran wagered his land. Again, Shakuni rolled the dice to take away his lands. And one by one Yudhishtran kept on losing his belongings. Yudhishtran’s jewels, wealth, and even his kingdom was won over, by Duryodhanan just by a roll of the dice. At one point ,Yudhishtran accepted his defeat and said that he had nothing to wager, further for the game. Shakuni convinced Yudhishtran to wager his brothers. Elders were shocked, but the game could not be stopped. So Yudhishtran agreed upon and I need not say that he lost Draupadi also. Immediately , not minding the elders dismay, Duryodhanan summoned Draupadi to the Dice hall. On learning about the happenings , she resorted to law. She asked the messenger, ” Did the king lose himself and then me or it is vice versa? ” And when she came to know that first Yudhishtran lost himself, she immediately said that the king had no right to wager her. “And so the wager is not a valid one. And I need not come there.” The messenger returned to Duryodhana and told what Draupadi said. Duryodhana became furious on hearing this. Instead of sending a messenger , he asked his beloved brother Duchasana to bring Draupadi to the Dice Hall. Posted on December 10, 2015 December 10, 2015 by RajalakshmiParamasivam. Vidhura who was there to witness Draupadi’s swayamvara, undserstood that it was Arjuna who won Draupadi’s hands. Later he also came to know about the marriage of Pandavas with Draupadi. He informed about this to Bheeshmar, who felt very happy about the survival news and marriage of Pandavas. Both Bheeshmar and Vidurar went to meet Dirithirashtran and informed all the happenings , about the Pandavas. They also recommended that the Pandavas should be invited to Hastinapuram. Dirithirashtra hiding his disappointment ,about the Pandavas survival and their marriage,tried put on a happy face. But he was reluctant to invite them. He feared, that the kingdom will then slip from the hands of Duryodhana, his son. But on repeated advices of Bheeshmar, Vidura, Kripachariar and Dronachariar , he agreed to invite them. Accordingly, word was sent to them to return to Hastinapuram. The Pandavas, with their wife Draupadi and mother Kunthi reached Hastinapuram. They were given a very warm welcome . Kunthi with her sons and daughter-in-law Draupadi was staying there. But there seemed to be a strained relationship between the Kauravas and the Pandavas. Dirithirashtra gave a suggestion that a small part of their kingdom be given to Pandavas.They can set up their kingdom and rule from there with Yudhishtran as the king. Yudhishtran, who always respected Dirithirashtran words, agreed to this plan. With Sakuni and Duryodhanan’s approval Dirithirashtran gave a land called Kandavaprastha to Yudhishtran and asked him to rule that.Kandavaprastha is a barren land and that was fully occupied by snakes.Nagushan, the snake is the king there. Pandavas were aware of the nature of that place. But without uttering a word in protest, readily agreed to move there. Pandavas with their mother Kunthi, and wife Draupadi left for Kandavaprastha. Many inhabitants of Hastinapuram follwed them to Knadavaprastha. The snakes showed their protest by spitting venom and killing ,many people. But Arjuna with his archery skills was able to fight back and win over them. Though he won over them , Nagushan, the snake king went into hiding. Then they started to build the kingdom. Slowly but steadily the work went on. Lord Krishna also rendered a helping hand. Lord Krishna ordered the divine architect ” Mayan”, to help the Pandavas in building the kingdom. Mayan with his divine powers built a beautiful kingdom for the Pandavas. The Pandavas palace was built with so many tricky ideas , with many deceptive illusions ,that some deceived the eyes of the observer. Yet, it was such a beauty! The kingdom was so beautiful that it resembled the abode of Lord Indra. There is no wonder that it came to be called as Indraprastham. The Pandavas were ruling the place for sometime without any trouble. But then everyone in the kingdom asked Yudhishtran to perform the Rajasuya Yaga. In those days performing Rajasuya Yaga, is a symbolism of a succesful ruler. Yudhishtran agreed and invited kings from far and near for the yagna . That included Duryodhanan and Karnan too. All the kings with their convoy , promptly attended the Rajasuya Yaga. The palace, caught everyone’s attention especially that of Duryodhanan’s eyes. Duryodhanan stuck with wonder, looked around.He could not believe that a barren land could turn into a dream world like this. He saw many things around him which deceived his eyes. When he was walking around with jealousy, he was about to be fooled by the appearance of a still floor , which turned out to be a pool of water. Not aware of that he tried to step on it . Alas! he fell into the pool and water splashed all over. Draupadi who was looking at this from the first floor gave a loud hearty laugh. Duriyodhanan fully wet was greatly upset over this. He felt insulted by Draupadi. He inturn wanted to insult Draupadi and left for Hastinapuram. For long a time to come Draupadi’s loud laughter kept lingering in his mind. That constantly reminded of his insult. He was waiting for an opportunity to give back her insult. Posted on November 18, 2015 November 18, 2015 by RajalakshmiParamasivam. I left the Pandavas in Ekachakra. Now we can see them in an arena in the kingdom of Panchalam .After hearing the news of Draupadi’s swayamvara , pandavas also came to Panchala. Princes from far and near have assembled in Panchala for the swayamvara. Durupadan had arranged for a contest wherein the princes should shoot the eye of a fish with one arrow. The fish is fixed to a wheel which keeps circling on the roof of the hall. The prince who wins the contest will marry Draupadi. King Durupadan was so sure that Arjuna will come to the contest and win Darupadi’s hand. Only, with this wish in mind he had aranged for the archery contest. If we look around , we can see so many familiar faces around the arena. King Durupada, his son Drishtathyumnan, his pretty daughter Draupadi , dressed beautifully, waiting to garland her bridegroom. Many kings and Princes were waiting, to win the archery contest and take Darupadi’s hand in marriage. Along with them, to witness the hapenings, Lord Krishna is also there. . Among the contestants, were the kaurava prince Duryodhana and the king of Anga, Karna. But none in the hall, except Lord Krishna, recognised the pandava princes who were in the guise of brahmins. After all the guests had arrived , the contest started. all the kings and princes , tried to shoot the eye of the fish. But in vain. Some were not even able to tie the string of the bow. Duryodhana was no exception. 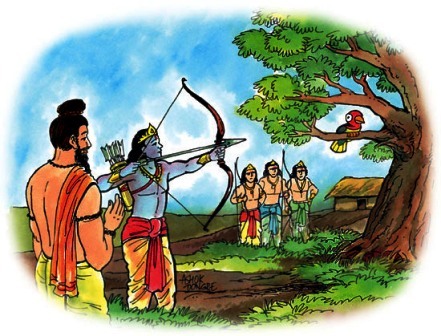 As we are all aware Duryodhana, was not good at archery and also Karna was not allowed to take part in the archery as Draupadi objected . Now Arjuna in the guise of brahman, came forward and asked the king if he would be allowed to take part in the contest.King Durupadha accepted this request as there was no kshatriya warrior who could win the contest. Arjuna came to the arena , took the bow in his hand, tied its strings and focussed on his target. And yes. He shot his arrow at the eye of the fish and brought it down. The whole crowd went into jubiliation praising the brahman. King Durupadhan was a little uncomfortable with the fact that a poor brahmin is taking the hands of his daughter Draupadi.But he had no choice. He also had a doubt that this brahmin, could be Arjuna in disguise. As soon as Draupadi garlanded Arjuna, he took her with him and walked towards their home. Then prince Drishtathyumna (brother of Draupadhi) silently followed Arjuna, Draupadi and other pandavas, without their knowledge. There he saw, Kunthi and now was happy that Draupadi had garlanded a kshatriya prince. But what happened next was something shocking to him. Pandavas with Draupadi, entered the home.Then the youngest of all Sahadev shouted,” Mother . Look at what we have bought.” Kunthi was in the midst of her prayer. Instead of looking at what they have bought, she said,” As always, share that among yourselves.” At this all the five brothers and Draupadi, were shocked. Then she turned and found the beautiful Draupadi standing there. Kunthi realised her mistake.But she cannot do anything about it. It is said ,” We are slaves of the words, spoken.” Kunthi and pandavas were no exception to this. Finally it was agreed upon that the pandavas would marry Draupadi. The shocked Dristathyumana , returned to Panchala. He told about this marraiage, to King Drupadhan. At first the king was angry, but as advised by learned men , he conducted the marriage. The news of the Pandavas marriage with Draupadi reached Hastinapura. The royal family at Hastinapura decided the next course of action. How are they going to react to this? See that in the next post. Posted on March 20, 2015 March 20, 2015 by RajalakshmiParamasivam. In the last chapter we left Kunthi and her sons in the town of Ekachakra. After escaping from the wax palace, they disguised themselves as Brahmins for fear of facing, another foul play by the Kauravas. A Brahmin of the village gave shelter to the Pandavas. The five sons of Kunthi seeked alms in the village for their daily food. Ekachakra was always in trouble by a demon named Bahasuran who was terrorising the village. He killed the animals and also the people of the village and ate them as his food. The people of the village were always in constant fear of losing their lives. They did not have the strength to fight this demon and drive him away or kill him.. So they stuck upon a deal with him. By the deal the villagers will send rice,meat , wine and a person of the village for his meal. The families in the village took turns to send the person as meal for the demon. Satsified with this deal the demon gave less trouble to the village. But each family was filled with great sorrow when it came to part with their dear ones.But they were helpless and accepted their fate. The children on their part wanted to save the life of their parents and so they wanted to die instead of their parents.. But Kunthi convinced the brahmin family saying her son Bhima, is an extremely strong person and he is sure to kill Bahasura. With great reluctance Brahmin accepted to this idea. Accordingly, the next day, Bhima sat in the cart which contained large amounts of meat , barrels of wine .. and reached Bahasuran’s place . Bahsuran with his heavy body , long and fat hands and legs was sleeping in a shade. His snoring was so loud that it could be heard from a long distance. Bhima seeing him sleeping, woke him up. With great anger he woke up and saw Bhima. His anger turned into happiness, when he saw the hefty Bhima. But Bhima pulled him with one hand and smashed him against a rock. Bahasuran ,though taken aback by Bhima’s action, retaliated back with the same power. Both of them fought for a long time. In this long battle , Bahsuran was killed by Bhinma. Bhima returned back to the village and narrated the fight that went on between him and Bahasura and also said that Bahasura was killed. The villagers rejoiced and thanked him for bringing peace back to the village. On hearing this Yudhishtran, the eldest of the Pandavas asked Arjuna to take part in the contest and win Draupadi’s hands. Accordingly Arjuna accompanied by his brothers headed towards Panchalam. Did Arjuna win Draupadi’s hands in the swayamvaram……..
Let us wait and watch the contest. That is going to be really interesting……..
Posted on February 16, 2015 February 16, 2015 by RajalakshmiParamasivam. In the previous chapter the Pandava princes on the orders of Diruthirastran, were heading towards Varanavatham a dense forest. Before leaving, Vidurar advised them. What was that?Let us see now……. 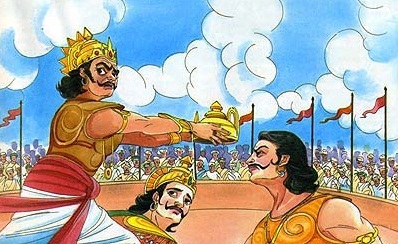 Wise Vidurar, expecting foul play from the Kauravas, advised Yudhishtran by telling, ” Yudhishtra, Keep in mind that if there is fire around, the rats will dig a burrow in the ground and escape.” Though Yudhishtra did not understand the implied meaning of these words, he was sure that his advice is sure to help them during times of need. Then they proceeded towards Varanavatham. There as per the plans of Shakuni , his servant Purochana had built a beautiful palace made of wax. The palace was a pretty one . Shakuni had also asked Purochana, to maintain secrecy about the palace being made of wax. Purochana had built this palace with the help of his wife and his five sons. And so the secrecy of wax palace did not leak out. The Pandavas were welcomed by Purochana and his family. Pandavas were amazed at the beauty of the palace, unaware of the danger they are going to face. But very soon they understood, that it was a wax palace and it would pose a threat to their life. They also understood , that sooner or later the wax palace would be set on fire to kill all of them. The Pandavas with their mother queen Kunthi , planned to escape from this evil act. Now they remembered the advise of Vithurar to dig an underground tunnel. They also decided to go to exile for some time hiding from the eyes of Kauravas. Accordingly, Queen Kunthi invited Purochana and his family for a dinner to the wax palace, as a mark of honour, for building such a beautiful palace. Accordingly Purochana and his family came to attend the dinner. After dinner, they took rest in the palace and went to sleep. 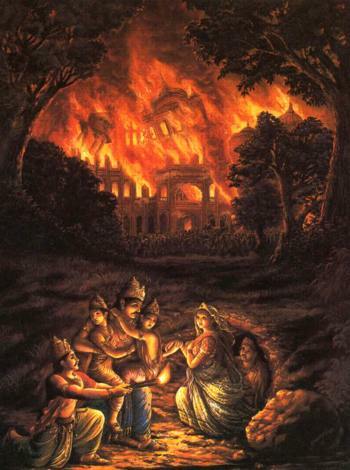 As soon as they slept, the Pandavas dug an underground tunnel in the palace and then set fire to the wax palace . Purochana, his wife and their five sons caught in the fire and died. Pandavas escaped through the underground tummel , but the kauravas thought that their evil plan killed the Pandavas . They tried to put on a sad face and performed the last rites for Pandavas. But, Vidurar with the help of his spies learnt that the Pandavas were safe and informed about this to Bheeshmar . Both of them maintained secrecy about the Pandava princes. In the mean while Pandavas , after escaping from the wax palace travelled and reached HidimbaVana a forest for Rakshashas( demons) . Hidumba , the demon was the king of the forest. His sister , Hidumbi also lived there. These demons had magical powers and they can change their looks as they want. We should not forget that they are also cannibals( one who eats human beings). In this dangerous forest Pandavas were travelling. On seeing the Pandavas , Hidumbi first decided to eat these human beings. But on seeing the hefty Bheema, she changed her mind and fell in love with Bheema. First Bheema was reluctant to accept her love, but later on he married her . A son was also born to them . His name was Gadothgajan. In accordance with his lineage, he also possessed some magical powers. ( Later in Kurukshetra war, Gadothgajan had a chance to use his magical powers). By then, it was almost an year . Then they decided to move from that forest and started their travel. They reached a small town called Ekachakra. Posted on November 22, 2014 November 22, 2014 by RajalakshmiParamasivam. Karna made King of Anga. After learning in the ashram of Guru Dronacharya ,time arrived for all the princes to return back to Hastinapuram and prove their talent.Everyone gathered in an arena. Dhirithirashtran, Gandhari, Kunti. Bheeshmar, Vidhurar, Kulaguru kripachariar , Shakuni and the citizens of the kingdom were waiting for the arrival of the princes. And the princes arrived at the stipulated time. Dronacharya called one by one all the princes . They all proved their talent. Dronacharya conducted a competition to prove their talent. Duriyodhana, Duchasan and all other kaurava princes and the Pandava princes put in their best to win . But undoubtedly , Arjuna emerged victorious. This really worried Shakuni, as he wanted his nephew Duriyodhana to be the unbeatable. Everyone’s eyes in the arena turned towards this young man. When Karna got himself ready for the fight, he was stopped by Bheeshma, Dronacharya and other respectable people of the kingdom. For this Karna replied, ” Iam Karna , son of the charioteer Athirathan.” (Though Karna knew that he is the adopted son of Athirathan, he did not know who his parents are. )Though he said that his father’s name as Athirathan, by his looks Kunthi realised that he must be her once abondened son . On realising it she fainted. She was taken care of the maids . At this karna felt very sad . Seeing all this, Shakuni realised that Arjuna is mighty and there should be someone equally mighty to support kauravas. Realising the talent of Karna, he had a secret consultation with Duriyodhana. Karna was crowned as the king of Anga Desha immediately by Duriyodhana. By the time all these incidents took place, it was time for sunset. And after sunset it was the rule then there should not be any fight or competition. In accordance with that everyone left the place . Both the Kaurava princes and the Pandava princes went to live in the palace of Hastinapuram. Duriyodhana breeded enmity towards the pandavas and Shakuni fuelled this by giving him cunning advises. Both of them understood it is not possible to overthrow Yudishtran from the crown prince throne. They thought another way to overthrow him . Yes Shakuni decided to play some mischief and kill all the pandavas and Kunthi . With an idea to kill them, Duriyodhana asked Drithirashtra to send the pandava princes and Kunthi to Varanavatham for sometime.Varnavatham is a dense forest . Dirithirashtran was aware of the evil thoughts of his son and Shakuni. his love for his son is such that he too, wanted Only Duriyodhana to be the crown prince. So, he agreed to send the Pandavas to Varanavatham. He called the pandavas and asked them to go to Varanvatham for a brief period. Though Yudhishtran sensed some foul play in this, he could not disobey Dirithirashtran’s order. and so he agreed. Pandavas with their mother Kunthi set off to Varanavatham.Before starting to Varanavatham, Vidurar met Yudhishtran and gave him some advice. What happened in Varanvatham?.What was Vidurar’s advice? Posted on October 28, 2014 October 28, 2014 by RajalakshmiParamasivam. After a gap of two weeks we are here back in Hastinapuram. In Hastinapuram Pandu ruled the kingdom to everyone’s satisfaction.In those days,it was customary for kings to go for hunting . It was considered as a sport then. And Pandu was no exception to this . He went for hunting to the forest . He was accompanied by his two wives Kunti and Madri. While he was hunting , his arrows hit a sage by mistake and killed the sage. The sage died cursing Pandu . Worried about his curse , Pandu did not want to return back to the kingdom. He took to Vanaprastha* and Hastinapuram was unaware of this. In the mean time Kunti gave birth to three sons, Yudishtran, Bheeman and Arjunan. Madri gave birth to Nakulan and Sahadevan. These five brothers were bestowed with special qualities. Yudhishtran , known for his righteousness (dharma) and integrity, Bheema known for his valour and strength, Arjunan famous for his archery skills , while Nakulan and Sahadevan had divinely medicinal powers. These five sons came to be called as Pandavas . In Hastinapuram Dhirithirashtran’s wife Gandhari gave birth to one hundred sons . Duriyodhanan was the eldest among them . One of his brother is Duchathanan. Duriyodhanan also had one sister named Duchalai. These sons were called as Kauravas. King Pandu was in the forest and his sons known as Pandavas, were growing up. One day, as it was fate, King Pandu died and along with him his second queen Madri. Queen Kunti along with her five sons(Pandavas) returned to Hastinapuram . Hastinapuram had lost its king . Dhirithirashtran was blind and so he could not be crowned as the king. It was then decided by Bheeshmar,Sathyati and Vidurar,to make Dhrithirashtran as King-in-charge, till Yudishtran( eldest of all ) grew up to assume throne. Accordingly Yudishtran was announced as crown prince. Soon after, Sathyavati took to Vanaprastha and left the kingdom. Though Duriyodhana did not like Yudhishtran being announced as the crown prince, he was helpless and could do nothing about it. As a result his enmity with the Pandavas grew in leaps and bounds.Now and then Duriyodhana played some mischief against the pandavas. His uncle /Mama, Shakuni also wanted his nephew Duriyodhona to be the crown prince. By speaking ill of Pandavas, he added fuel to Duriyodhana’s enmity towards the Pandavas. Though Dhrithirashtran and Gandhari were aware of Duriyodhana’s hatred attitude, they did not correct him . The cost they paid for this in later life, was plentiful. Time came for the princes to get educated and learn various arts of fighting. ( In those days the kings should learn the art of fighting). Accordingly the princes were all sent to Guru Dronacharya’s Ashram to learn. The Pandavas and Kauravas had their education under the guru Dronacharyar.. 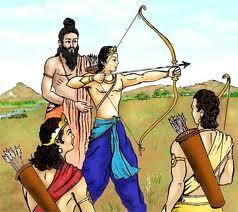 Along with them Dronacharya’s son Aswathama also had his education along with the princes. Aswathama cultivated good friendly relationship with Duriyodhanan. Arjuna learnt everything with great care and devotion. Now and again, he proved that he is the best of all students. Yes. He excelled every one in his archery talent. There are many incidents which goes to prove his talent in archery. No doubt Arjuna became Dronacharya’s favourite disciple. Now , it is not proper to forget about Karna at this juncture. He too had his education. He was also good at archery. Time arrived for all the princes to return back to Hastinapuram and prove their talent.Everyone gathered in an arena. Dhirithirashtran, Gandhari, Kunti. Bheeshmar, Vidhurar, Kulaguru kripachariar and the citizens of the kingdom were waiting for the arrival of the princes. Let us also wait for their arrival…………. * vanaprastha–A Vanaprastha (Sanskrit: वानप्रस्थ) is a person who is living in the forest as a hermit after partially giving up material desires. Posted on October 15, 2014 October 15, 2014 by RajalakshmiParamasivam. Devaki and Vasudevar, blaming their fate , faced life in Mathura’s dark prison. Kamsan’s security guards kept a constant vigil over this fate blown couple. When the first baby was born to Devaki , immediately, the guards informed the tyrant king, Kamsan. Wtihout delay, Kamsan came and snatched the baby from his sister Devaki’s hand. Devaki and Vasudevar pleaded , not to kill the baby. But all their plea went into deaf ears. Much to the anguish of the couple , Kamsan killed the baby in front of their eyes. Devaki’s sorrow knew no bounds. Vasudevar watched all this helpless . Not only their first baby , all six children born to them met with the same end. The couple was extremely sad. Vasudevar and Devaki helplessly blamed themselves for all the sorrow happenings. 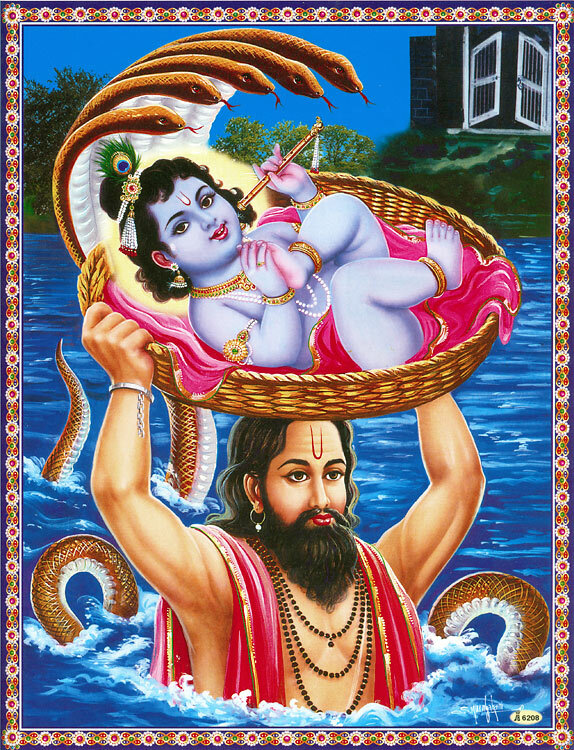 When it was time for their seventh child , Lord Vishnu decided to intervene. He asked Yogamaya ,the Godess to transfer the embryo of ‘ SeshNag ‘ ( seventh child) from Devaki’s womb to Rohini’s womb. Rohini is another wife of Vasudevar. She was in Nandigram (Gokulam). 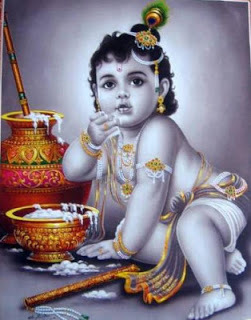 The child born to Rohini is Balaraman., brother of Lord Krishna. When Balaraman was born in Gokulam , Devaki gave birth to a baby, which was again killed by the cruel king kamsan. Time came for the birth of the eighth child of the ill fated couple, Devaki and Vasudevar. Lord Vishnu himself decided to descend on earth . Yogamaya the godess, controller of darkness and ignorance made way for the safe passage of baby Krishna , Lord Vishnu’s incarnation to Gokulam. By Her powers, she made all the security guards in Mathura prison to sleep. When Kamsan’s guards were relieved from the spells of Yogamaya, they saw the couple holding the baby girl in their hands. The information of the baby girl reached the ears of Kamsan. He knew this was the eighth child and as by the prophecy this child would kill him. He stormed into the prison angrily and smashed the baby from the arms of Devaki. When he was about to kill the baby, by thrashing against a rock, the baby sprang up in the sky and took the form of Yogamaya and warned Kamsan, ” O! King Kamsa. You are a fool . Iam not the baby born to kill you. Your destiny are in the hands of a boy . He is safe in Gokulam. ” Uttering these words , Yogamaya vanished. Krishna was growing up in the beautiful Gokulam as the son of Nandagopalan and Yasodha. Unaware of the fact that Krishna is Vishnu’s incarnation, Nandgopalan and Yasodhha brought up Krishna. So is the case with Rohini. She was not aware about the incarnation of Seshanag as Balaraman. Krishan and Balaraman grew up in Gokulam. Krishna was a lover of milk, curd , and the pet boy of the whole village. He is affectionately called by the villagers as ” Butter Thief.” Even, now his devotees call him , in the same name with all affection. His pranks knew no bounds. He also did not fail to show glimpses of his divinity. His dance the Kaliya Nartana, the way he killed the demon and demoness sent by Kamsan to kill him, lifting the Govardana hills , to save the villagers and the cows are a testimony to His divinity. He also enchantened every one , even the cow herds by his divinely Flute music. There were instances when people had even swooned by his music. 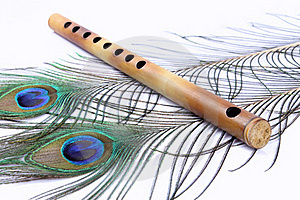 If we are to talk about Sri Krishna’s pranks , time and place will not suffice. I have written one or two of His Pranks in MY Story Court. You can read them here. I intend to write more there . When Krishna grew up, he went back to Mathura, killed his cruel uncle ,Kamsan and freed his parents. People of Mathura ,rejoiced at the death of Kamsan. Ukkraseana was made king again. It is more than two weeks since we left Hastinapuram. Now shall we travel back to Hastinapuram and see what is going on there…..
Posted on October 3, 2014 October 4, 2014 by RajalakshmiParamasivam. We are now, in Shursena . The king of Shursena is Sura. He had two children. A daughter by the name Pirudhai and a son by name Vasudevar. Pirudhai was given for adoption to the king Kunthi Bhojan, cousin to shura of the neigbouring kingdom. Pirudhai grew up in Kunthi Bhojan’s palace. as his daughter. She was there after called as Kunthi. Sages used to come to kingdoms and will perform yagna in the palace . This was common in those days and the kings also used to give all their help for these sages. 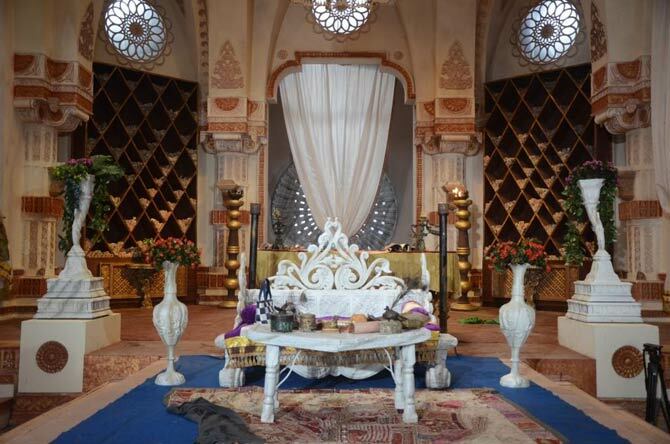 Sage Durvashar , who was known for his quick temper came to Kunthi Bhojan’s palace to perform one such yagna. He asked the service of the princess Kunthi . Though Kunthi was fearful of this sage, to avoid his curse, she served the sage . Kunthi got scared , as she did not expect this. She did not know what to do with the baby son. she was also worried that her name would be tarnished. With all this in mind , she placed her son on a saree of hers and kept it in a bamboo box and set it to sail in the river. As fate would have it the box travelled to the banks of Hastinapuram . There the box caught the attention of Athirathan, the king’s chariot driver. He was happy to see a baby boy in the bamboo box with a beaming smile. He took the boy to his wife Rathai . They decided to bring him up as their son. The little boy was called as Ratheyan. This Ratheyan was later called as Karnan, who played an important part in the Mahabaratha war. Kunthi, then married Pandu and became his wife. Her blood brother Vasudevan married Devaki the princess of Ukrasena. Devaki had a brother called Kamsan. He ovethrew his father and became the king of Vrishni with its capital as Mathura. He was a tyrant ruler . Soon after the marriage of Devaki, Kamsan was told by a prophecy that the eighth child of Vasudevar and Devaki will kill him.(kamsan) . Kamsan, at first thought to, kill Devaki, but as a loving brother did not kill her. Instead, he arrested Devaki and her husband Vasudevar and kept them in a jail in Mathura. He also warned them that he would kill all the eight children that wll be born to them. Who is that eighth child? We shall see that in the next chapter………….to be continued.